Join the adventure in Jurassic Park in this five-reel video slot from Microgaming based on Steven Spielberg’s legendary film. 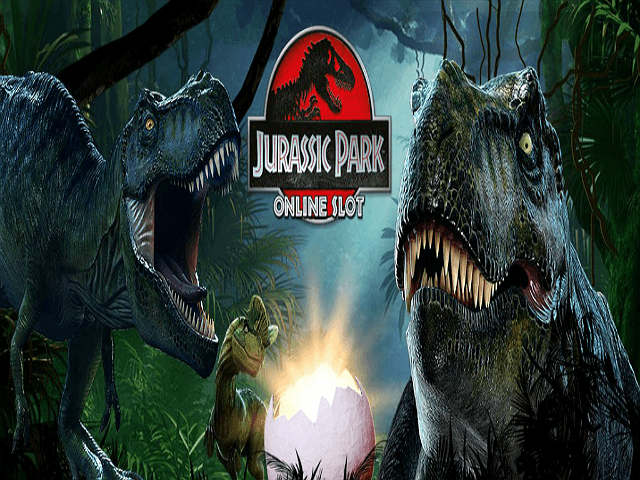 With state-of-the-art graphics, action-packed features and characters and imagery from the movie, the Jurassic Park slot machine is as awesome as the Oscar-winner itself. Don’t believe us? Then let our review convince you as we take you on a tour through Jurassic Park. Despite the slot title being released nicely ahead of the Jurassic World movie in 2015, it’s actually based on the original 1993 classic, the first instalment in the Jurassic Park series based on the 1990 novel by Michael Crichton. The Jurassic Park films are renowned for their groundbreaking use of CGI and special effects, and Microgaming has tried to live up to that in its slot product. The game is one of the first to use parallax scrolling, a visual effect whereby background images move slower than those in the foreground, creating a 3D illusion and a greater sense of depth and immersion. The reels are set against a dark jungle with the camera moving leisurely across the foliage. The gentle, atmospheric music heightens the tense and eerie mood that the game tries to recreate, but it becomes more uplifting when you land a winning combination. Five-of-a-kind wins even initiate a clip and genuine quote from the character. Once you’ve taken in the impressive graphics, it’s time to set your bet. To do this you click on the ‘Bet’ button where you choose your coin value between 0.01 and 0.20, and your number of coins between one and ten. This figure is then multiplied by the 30 coins to give you your total bet. 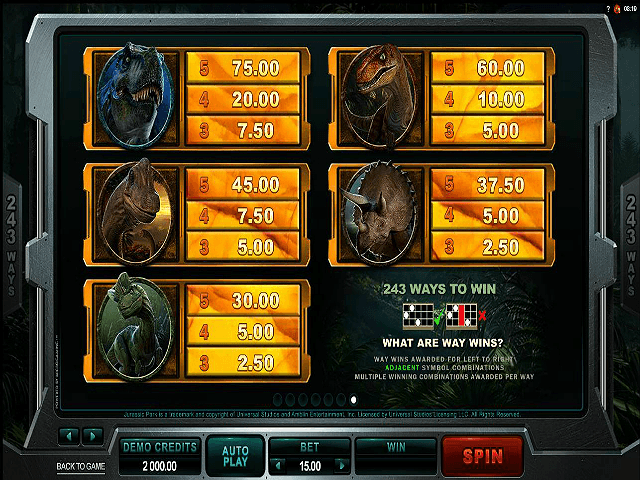 There are no paylines in Jurassic Park – instead the game offers 243 ways to win. The symbols on the board are a mixture of human and dinosaur characters from the hit film. The highest-paying avatars are professor Alan Grant and his graduate student Ellie Sattler, while the five different dinosaurs are the lower-ranked icons. You can get some decent payouts for landing five characters, but it’s in the bonus elements where the adventure really gets interesting. One feature to look out for during the base game is the T-Rex Alert mode. 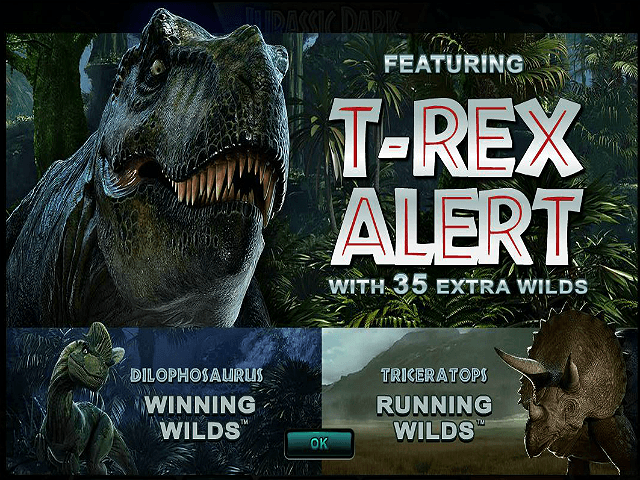 This is triggered by random appearances of the T-Rex and lasts for six spins, during which you can’t increase your bet; 35 extra wild symbols (the Jurassic Park logo) are added and are stacked on all reels. 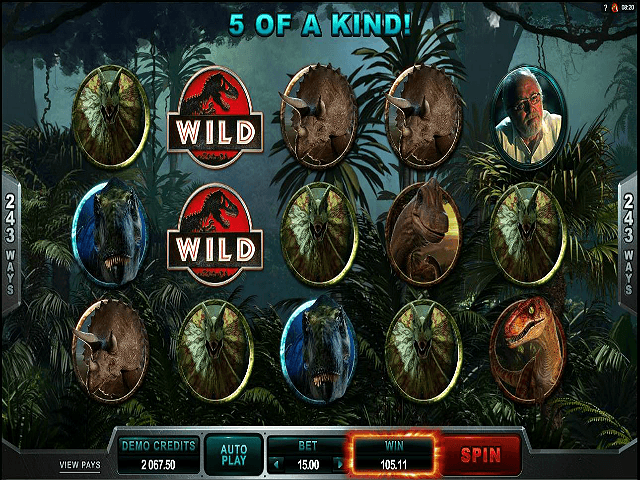 The main feature of the Jurassic Park slot is the Free Spins game. There are five different Free Spins games but you have access only to the first until you’ve activated Free Spins 25 times. All five give you 12 spins but each one comes with its own distinctive feature, whether it’s random multipliers, running wilds or split wilds. The one you’ll play first is Tyrannosaurus Rex. The T-Rex will be your friend during this feature as he may appear to turn up to all five reels completely wild, guaranteeing you wins. The other four are Velociraptor, Triceratops, Brachiosaurus and Dilophosaurus. Obviously, it takes a while to access these but when you do, the game runs as wild as the dinosaurs in the cinema, and it’s certainly worth the wait! If you can't get enough of dinosaurs and are looking to sink your teeth into another brilliant slot game, make sure to check out Playtech's Jurassic Island. 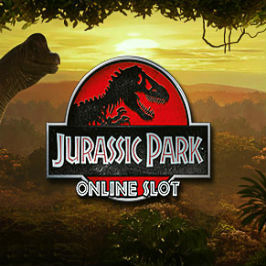 If you like Jurassic Park - You'll like these slots too!